Home / Stock Picks / Hot Stocks / Bill Ackman Bought Starbucks Stock. Should You? Shares of Starbucks (NASDAQ:SBUX) bucked a broader market sell-off on Oct. 9, after famed hedge fund manager Bill Ackman revealed a sizable stake in the coffee house operator. At a conference in New York, Ackman announced that his Pershing Square fund owns about 15 million shares of Starbucks stock, for a total position valued at roughly $900 million. That is no small position, and the market took notice. In response to the news, the stock popped 3%. Is this a rally worth chasing? Does Ackman have his groove back, and should you follow him and buy Starbucks stock, too? I’m unconvinced. At its core, SBUX is a great company with a slowing growth narrative. Thus, growth in a long-term window is stable, but not explosive or even normal by historical standards. From this perspective, you want to buy Starbucks stock when the valuation is discounted, and sell it when the valuation is full. The valuation was discounted back in July, when SBUX stock was below $50 and trading at 18X forward earnings. That is why I bought that dip. But, here and now, the valuation isn’t discounted anymore. If anything, at $58 and 22X forward earnings, the valuation is full. Thus, I think the rally in SBUX stock has already happened, and that buyers here are shooting behind the duck. Starbucks has learned the hard way that it is nearly impossible to be huge and expensive in a competitive marketplace. The big unit expansion dreams at Starbucks entail the coffee house operator dominating the coffee game like McDonald’s (NYSE:MCD) dominates the food game and Amazon (NASDAQ:AMZN) and Walmart (NYSE:WMT) dominate the retail game. But, McDonald’s, Amazon and Walmart are all among the cheapest, if the not the cheapest, option in their markets. Thus, they are positioned for robust mass market adoption. Starbucks is not the cheapest often in the coffee market. As such, any competitor can come in and steal market share by out-pricing Starbucks. This is exactly what has happened over the past few years. McDonald’s and other cheap fast-casual chains built out their breakfast offerings to be more Starbucks-like, and lower-priced Dunkin (NASDAQ:DNKN) started expanding westward. The result? Starbucks started losing price-oriented customers to cheaper competitors. U.S. comparable sales growth slowed from 5% and up, to 1% last quarter. Meanwhile, traffic growth has fallen into negative territory. Despite slowing growth in the U.S., the bull thesis that Ackman and others keep coming back to is that China provides a huge new opportunity. This is true. With just 8,200 stores in the China-Asia Pacific region, Starbucks is dramatically underdeveloped and has lots of room to open 10,000-plus more stores over the next several years. But, comparable sales growth in the CAP region was negative last quarter, led by a 3% decline in traffic. That is no good. That means that the dynamic playing out it in the U.S. (Starbucks losing share to cheaper competitors) is also playing out in China. Thus, any and all growth going forward will be from unit expansion, not higher unit performance. Unit expansion without strong comps gives Starbucks decent, but not great, go-forward growth fundamentals. At $58, the Starbucks stock price is appropriate, especially considering its stable but relatively small growth prospects. Starbucks isn’t going away any time soon. This is the brand in the coffee game. While its dominance is slipping, it is tough to see consumers all together forgetting about Starbucks. Also, unit growth expansion in China should keep revenue growth largely above 5% for the next several years. But, without higher unit performance and in the face of bigger competition, it will be tough for Starbucks to expand margins through price hikes and opex leverage. From this perspective, Starbucks is a mid single-digit revenue growth company with mitigated margin drivers. Under those assumptions, Starbucks can reasonably do about $3.80 in earnings-per-share in five years. A growth average 20X forward multiple on that implies a four-year forward price target of $76. Discounted back by 10% per year, that equates to a year-end price target in the upper $50’s. Consequently, at current levels, Starbucks stock appears fully valued. The time to buy SBUX stock was back in July, when the stock dropped below $50. The stock has rallied 20% since then, and I’m inclined to say the best for this stock is in the rear-view mirror. Going forward, Starbucks stock may head higher, but not by much. As of this writing, Luke Lango was long MCD, AMZN and WMT. 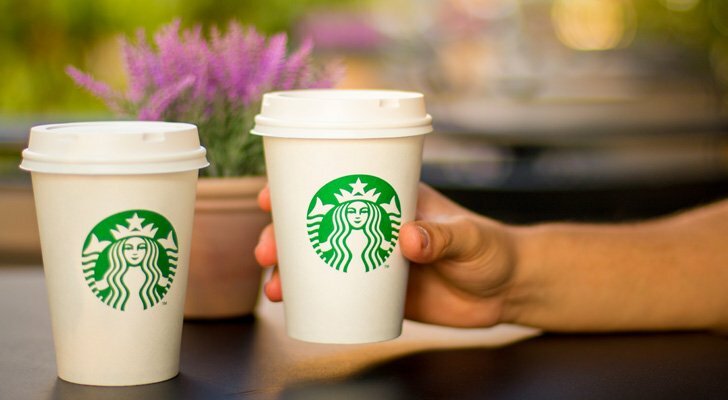 Article printed from InvestorPlace Media, https://investorplace.com/2018/10/bill-ackman-bought-starbucks-stock-should-you/.